New boss Kenny Jackett is certain he can keep Rotherham United in the Championship. 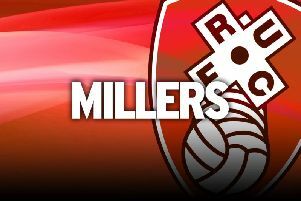 The Millers lost to an 86th-minute goal in his first match in charge, at home to Reading. But the 54-year-old, who was given a rousing reception by the New York Stadium crowd, saw enough in the 1-0 defeat to believe that he can pull off a rescue mission in the 32 remaining league matches. “I felt the workrate, effort and commitment of the players was very good,” he said. “We went toe to toe with Reading. We had a good number of chances and were a threat from set-pieces, we couldn’t convert them. Rotherham created the afternoon’s best chance, with Danny Ward being foiled by Ali Al-Habsi when he was clean through, before Paul McShane scored a close-range winner four minutes from time. The Millers won one and drew three of their 13 second-tier matches under previous boss Alan Stubbs and are bottom of the table after seven straight league defeats. But Jackett said: “Yes, I definitely feel I can keep them up.